Take to the skies again as “ Microsoft Flight Simulator X ” puts pilots back in the cockpit for more than 80 missions set all over the world . Want more ? Try the thrilling multiplayer mode where you can race your friends for victory and bragging rights. “Microsoft Flight Simulator ” delivers that sense of immersive realism that only the award winning Flight Simulator series brings to flight sim fans . And with advanced DX-10 graphics , heading into the wild blue yonder has never looked so good. New Mission s: 20 new missions , in Law Enforcement and Rescue , Astronautics , Racing , and Backcountry , will give pilots more chances to soar . Head to the Rockies to fight forest fires or fly relief supplies to the Congo . With the world beneath you , anywhere is possible. Dynamic Living World : Watch as the world under you comes to life , from the gates and fuel trucks at your local airport to the hustle and bustle of cities . Experience the challenges of landing at your local airport as day turns to night and as the seasons change . Multiplayer Racing : Race against friends online in challenges such as Red Bull Aerobatics , Sailplane , Cross Country , and Reno High Speed . 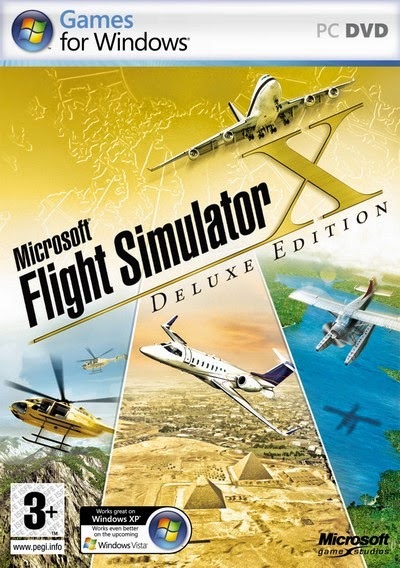 All in One Package : For the first time , “ Microsoft Flight Simulator X Deluxe ” gives players the chance to purchase “ Microsoft Flight Simulator X ” and “ Microsoft Flight Simulator X: Acceleration ” together in one bundle. 17 Responses to "Microsoft Flight Simulator X Deluxe Single Link full Version"
kok link nya kagak bisa om?? kok link nya kagak bisa om?? mohon pencerahannya oom..
ini include pesawatnya apa aja ya mas? mas, kok waktu diinstall muncul " insert the disk labeled : FSX disk 2 "
udah ane mount semua disknya terus waktu install mau selesai malah "Please Insert the disk labeled : FSX disk 2"
ini sudah sama expansinya apa belum ya gan ? gan kok masih demo? katanya full version? is so many download button where is the game link?